This week’s Tech Tuesday brings us up the slope to Eldora Mountain Resort, where our friend Scott has been carving up the mountainside. Through the Ignite Adaptive Sports Program, Scott has been going up to Eldora a couple times each ski season, using a sit ski. This last time he went up, however, we changed things up a bit. One of Scott’s major goals for this last year has been to increase his stability and stamina while standing or walking. He practices standing and walking exercises both at home and while attending classes at Imagine!’s CORE\Labor Source. So upon discussing this, Scott and the team decided to try out an A-Frame support stand for Scott to use on the slopes. It gives him plenty of assistance to bear his weight as needed, and as you can see in the video below, Scott had no troubles sailing off into the sunset. 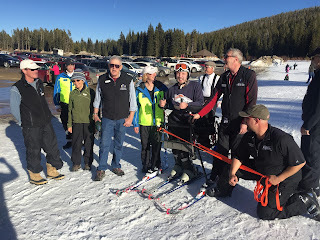 Stay tuned for more updates, and special thanks to the Ignite Adaptive Sports program at Eldora.